I love the zone I can get into when my imagination is running my brain. Every now and then it is like a spark ignites and my imagination springs to life, taking the reigns. The other parts of my brain punch their cards and go doze on the couch. Under imagination’s control, the noisy clutter dissipates and a clean vibrant white screen appears for ideas and concepts to form on. One idea links to another that transforms into something better. Then they get bumped to the side and a new idea bubbles to life sparking three different streams of thought. The colours are vibrant, the lines are crisp. Shapes and ideas click together at speed. It lifts me up, my energy pumps, it blows cobwebs out of my head. When this happens I can see possibility where I couldn’t see it before. It allows me to pick up an idea in my mind and turn it around and look at it from a different angle. On my mind’s canvas I can imagine that idea beside a variety of other ideas to see how they merge to form a network of ideas. The only thing better than letting my imagination run wild, is when I can inspire this same thing to happen in others. There is nothing quite like inspiring a group of people to imagine a vision into existence and materialise a path to get there through the power of their collective. It’s an inclusive and uplifting way to make change happen. As Antoine de Saint-Exupery, a French poet and pioneering aviator once said, “A rock pile ceases to be a rock pile the moment a single man contemplates it, bearing within him the image of a cathedral.” And when several people share the same vision it is even more achievable. There is a disconnect that sometimes occurs though when you have a group of people imagining something together. Each individual’s mind is thinking in shapes, colours and vibrant ideas. Yet when it comes to getting those ideas out of heads and onto a page or a whiteboard to form a shared idea – it gets captured in monochrome bullet points. Some of the magic gets lost in translation. Once the idea hits the board as a bullet point Logic and Organisation (who were dozing on the couch) snap to attention, wipe the drool off their chins and punch back in to take over. 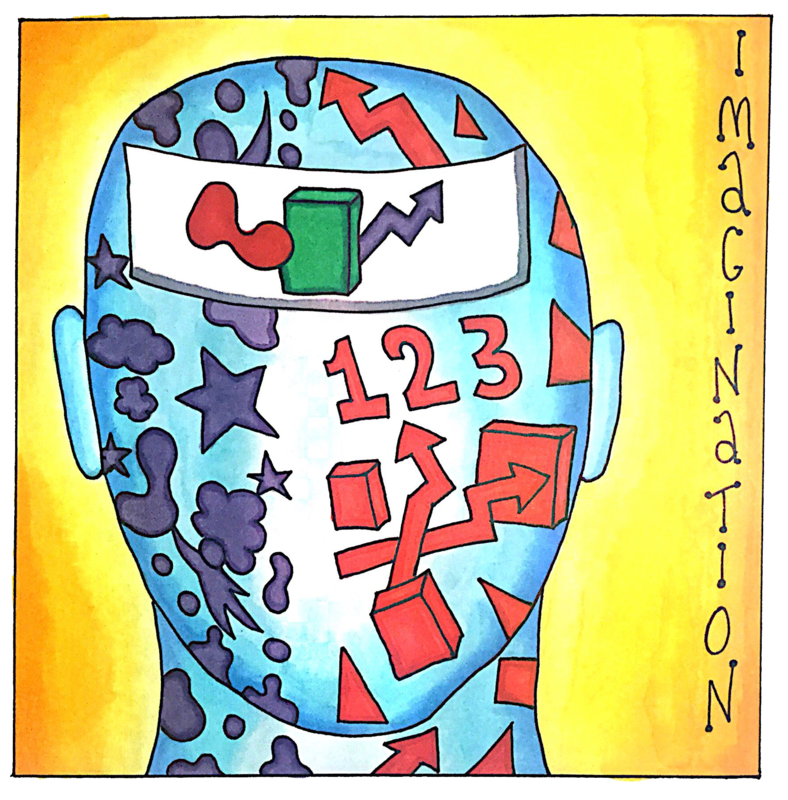 Don’t get me wrong, Logic and Organisation are great operators, but they shouldn’t be rostered on in the early parts of ‘blue sky thinking’, that is Imagination’s domain. Imagination is a great collaborator and her preferred partner in crime is Creativity. When you let Imagination and Creativity run the show, inspirational, collective visual stories can be born. Visual stories inspire action and motivate change a lot faster than a set of bullet points. Creativity here is not to be confused with artistic mastery. Inspirational visual stories do not require skilled drawing in life-like realness. Creativity is about finding the imagery that embodies an idea. It could be a simple icon, it might be multiple colours joining in a particular pattern, it could be a descriptive metaphor that enables deep layers of implied meaning. If this sounds like something you need to create with your team or on your project, the key is in how you prepare. It is difficult to be instantly imaginative if you’ve just rushed straight from a budget meeting. Our minds need a safe, clutter-free space for creative thinking to occur so think about what brain resetting activity you may need to start with. Set up your space for conversation to flow and centre it around your flipchart or whiteboard. Space is important. If you want people to be able to break into smaller groups to talk, does the room allow for it? This can be hard to do if you are all sitting around a big table. If you are looking to create a collective visual that incorporates the thinking and ideas of a whole team – the whole team should be there. If you want to inspire some ‘out of the box’ thinking, you might want to include some diverse thinkers in the group to intentionally provide different points of view. You don’t need to be able to draw to create visual stories. You could bring a stack of magazines and have your participants cut out a picture that represents their view. You could set a question such as ‘find the picture that best depicts where we are going.’ You can then collect these pictures onto your board and theme them to see what comes out. Alternatively, Emergent by Design have compiled a list of 21 different card decks you can purchase to use for ideation. Using a visual facilitator is another option. Someone who can take the ideas in the room and draw them up into a visual ‘map’ as the conversation is occurring. If this is something you need, then we should talk, I may be able to help you.